Seven Cambridge colleges have holdings totalling £20.7m in corporations engaged in oil and gas exploration, production and refining. Nine colleges hold investments in offshore funds, Freedom of Information requests on all companies in colleges’ direct investment portfolios have revealed. Oxford and Cambridge colleges will be hauled before Parliament in light of today’s revelations, John Mann MP, chair of the Treasury sub-committee, has claimed. One year ago, Oxbridge colleges were pushed into the spotlight when the Paradise Papers revealed that 29 of them had tens of millions of pounds invested in offshore funds, including in a joint venture to develop oil exploration and deep-sea drilling. Today, two investigations in Varsity and Oxford student newspaper Cherwell detail the relationships between several Oxbridge colleges and companies accused of human rights violations, several of which have also been listed among the top 100 companies responsible for 71% of global greenhouse gas emissions since 1988. At £9.1m, Trinity College, Cambridge holds the most investments in companies involved in oil and gas exploration, production, and refinement, out of the 45 Oxbridge colleges which responded to the information requests. Emmanuel had the second largest holdings in the sector across Oxbridge, with more than £5.7m invested in multinational oil and gas corporations Shell, Total, and Anadarko. Across six Cambridge colleges, a total of £6.6m has been invested in companies involved in arms manufacturing – Emmanuel College has the most investments in the industry out of the 45 Oxbridge colleges who responded, totalling almost £2.9m. Trinity was found to hold £8.2m in the top 100 companies responsible for 71% of global emissions. The college’s investments in Royal Dutch Shell total £1.2m – the second largest holdings of the colleges who responded to the information requests, after Emmanuel, which invests £1.6m in the company. Darwin, Lucy Cavendish and Selwyn were also found to have shares in Shell. Shell has previously come under fire, most notably for its activities in Nigeria. An Amnesty International report in 2017 thrust the company’s oil drilling activities in Ogoniland into greater scrutiny, detailing the lead-up to the Nigerian government’s internationally condemned execution of nine activists protesting environmental degradation of the Ogoniland land and waters, called the Ogoni Nine, in 1995. The report analysed internal documents released when a number of Nigerian individuals sued the company in the US in 1996. In a statement, a spokesperson for Shell told Varsity that the company has voluntarily reported on its environmental and social performance since 1997 in annual sustainability reports, and cited the company’s Shell Energy Transition Report, which “outlines how Shell’s strategy should enable it to thrive as the world transitions to lower-carbon energy”. £1.7m of Trinity’s investments are held in ExxonMobil. In 2011, The New York Times reported that the oil and gas company would face legal action for its operations in the Indonesian province of Aceh. Between 1999 and 2001, the company hired national army units to provide security for gas extraction and liquidation, members of which have been accused of torture and murder of civilians. Trinity also invests £1m in Chevron, £653k in Total, and £497k in BHP Billiton – all supermajor oil companies. It holds a further £408k in Rio Tinto, a multinational mining and metals corporation which ranks 24th on the list of 100 companies responsible for 71% of greenhouse gas emissions, and which has come under scrutiny for environmental degradation through its mining operations, particularly in Papua New Guinea. Together, the seven Cambridge colleges with holdings in the fossil fuels industry have invested £4.6m in total in Royal Dutch Shell, £2.4m in ExxonMobil, £1.6m in BP, and £1.5m in Chevron. College holdings in offshore investments became a subject of sharp criticism when The Guardian’s Paradise Papers revealed the extent of colleges’ investments into funds based in the Cayman Islands, Jersey, and Guernsey – so-called ‘tax havens’, which provide investors with greater financial secrecy than for UK-domiciled funds. Nine colleges out of the 20 who responded were found to hold offshore investments. Queens’ has the greatest holdings in offshore funds, totalling £51.9m. King’s and Corpus Christi hold £6m and £5.2m in offshore funds respectively. The Paradise Papers scrutinised one fund in particular: the $4.8bn Coller International, based in Guernsey. Its largest investment of $1bn was in Royal Dutch Shell. At the time, Trinity had an estimated £9.9m invested in Coller International. Recent data shows the college now invests slightly over £1.1m in the fund. The college declined to comment on the reduction. Corpus Christi said, regarding their investment in Heronbridge Investment, an off-shore fund with a Jersey structure, that the fund “is regulated by both the [UK] Financial Conduct Authority and the [US] Securities and Exchange Commission in the conduct of its investment business”, adding that the equity fund has “a number of international institutional investors”, including universities. Queens’ College and King’s College did not respond to requests for comment. 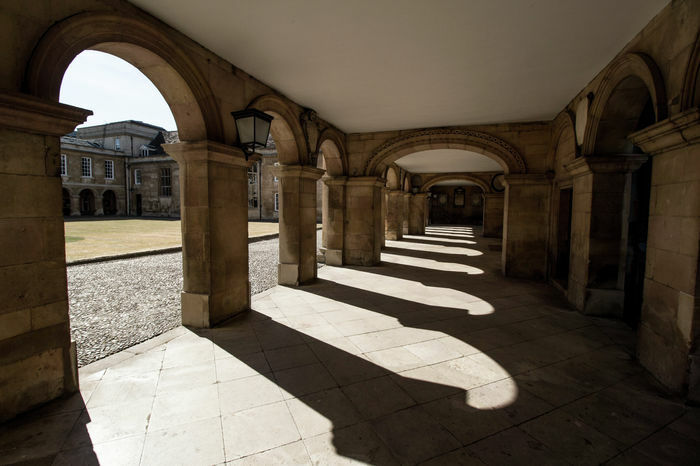 Investments by Cambridge colleges in off-shore funds amounted to less than those by several Oxford colleges, however – New College, Oxford was found to invest over £118m in off-shore funds. Where does the divestment debate stand in Cambridge? The past three years have seen a wave of pressure on the University to divest, from students, MPs, academics, and several activist groups, including a six-day hunger strike by pro-divestment campaigners, the forced removal of campaigners from a University administrative building occupation, and a shock resignation of a student representative on Cambridge’s divestment working group. To date, the divestment debate in Cambridge has focussed on the central University, leaving its constituent colleges outside the realm of sustained scrutiny. Certain colleges have nudged toward divestment from the fossil fuel industry – in March, Peterhouse confirmed that it had sold its direct investments in Shell, while Selwyn College has said that it has adopted a long-term bias to disinvestment from the sector which will include the eventual selling of its Shell investments. Most notably, in July, Queens’ was the first Cambridge college to announce that it would fully divest its endowment from the fossil fuel sector.